I came across this video the other day and have been thinking about it ever since. 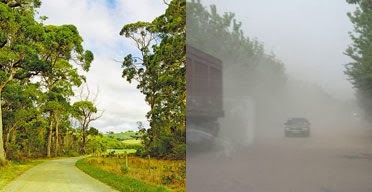 The video contrasts the town with the cleanest air and water in the world (Cape Grim, Tasmania) and the town with the dirtiest air and water (Linfin, China). It's interesting from an ecological standpoint, yes. But that's not what caught my attention. What caught my attention is that the people who have the dirtiest air and water seem to spend more time outside being social and they don't seem to be overly concerned about what's going in their bodies. And a visit to the town with the cleanest air showed a nice, trim town with nobody milling about outside enjoying their clean air and water. Now, I'm sure the people in Tasmania spend time outside. How could they not? And I happen to know they leverage their clean air and water status because that's how I came across the video in the first place. But it all got me thinking...do we appreciate what we have and where we live? So how much of it have I seen? Most of it. Mostly when I was a child. In the past 20 years, a bunch of new museums have been built...the Holocaust Museum, the Newseum, the Smithsonian National Air and Space Museum Steven F. Udvar Hazy Center* and the National Museum of the American Indian, for example. I've seen just one of them. The American Indian one...a few times. While the rest sound interesting to me, I haven't gotten around to it. Each year when the cherry blossoms bloom, I might do a drive by, but I don't stop. Similarly, I drive past iconic monuments and memorials all the time. Most of the time, I take the time to notice, but sometimes it doesn't even register. That doesn't mean I don't appreciate where I live. I do. Catching a glimpse of the Washington Monument from across the river can still take my breath away after nearly 40 years of living here. But I'm ashamed sometimes at how little I take advantage of the bounty in my midst. So I've been thinking about what I do appreciate in my life and what I maybe don't appreciate enough. I consciously appreciate my little home and my doggies. And nap time. And my independence. Then there's my body, which I should consciously appreciate, but don't. When you really focus on all the different elements of your life and note what you consciously give gratitude, attention and appreciation to, it can point out where some of your priorities are off...where and how you're spending your time in alignment to what you want from life. Truth is, I could ask myself why I live in a city with so many cultural opportunities when I spend most of my effort seeking quiet spots with fabulous views. While this place feels like home to me, perhaps I should question what else makes it uniquely fulfilling to me. The same could be said for friendships, jobs, hobbies...any part of our lives. Maybe we're living with something that was once appropriate, but no longer is. Or maybe we're just not thinking. So what's in plentiful supply all around you that you may not be availing yourself of? What might you be taking for granted? What "pure air" are you not breathing deeply in your life? *Longest name ever for what's known as the Air and Space Annex, where the space shuttle Discovery calls home.